Elliott Harper has won the 2016 International Carpet Challenge, by taking victory in the first two legs of the A-final. The British Schumacher driver, who started on pole position, faced competition in both A1 and A2 from second placed starter, Yannic Prumper, for the first minute or so of each run, but by half distance each time he had opened a lead to around one and half seconds, which he would then control until the end of the five minute encounters. Commenting on the win, Elliott described it as an “awesome weekend [for me] and a great event”. He also wanted to thank his Schumacher team mates, their combined testing and knowledge sharing being a key part of his success this week. The action behind involved battles for second between Yannic and Kyle Branson – the Capricorn driver challenging the multi-time ETS winner throughout most of the ten minutes of action, with the German coming out on top both times. Leg two saw a mistake from Kyle on the final lap, dropping him a few spots and allowing Olly to take third in the leg. With the win secured, Elliott elected to sit out the final leg. Yannic made a mistake on the opening lap, having chosen to run a second set of tyres the different balance caught him off-guard. 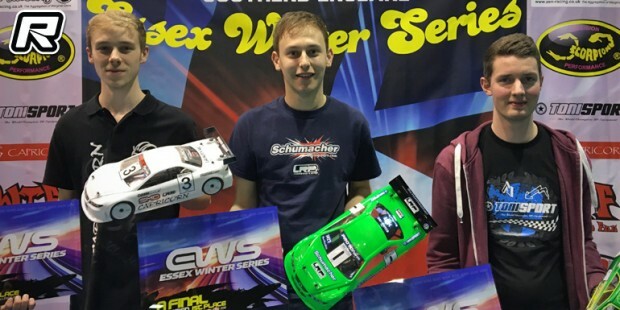 This allowed Kyle to take the win, after a race long battle from out-going ICC Champion Olly Jefferies. This win elevated Kyle to second overall, with Yannic third and Olly fourth. Super Stock was also wrapped up in two legs, with Jimmy Maddison putting in two “perfect” drives to take the wins. 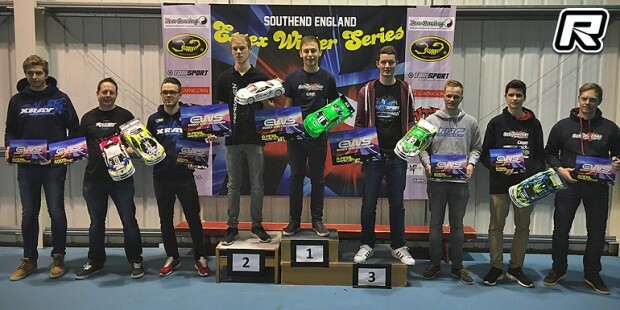 In typical stock-racing action, the battles for every other position raged throughout each of the races, with Brit James Hart taking second in the first leg, after an opening lap coming together between Martin Hofer and Max Machler. Hofer and Machler finished second and third respectively in the second leg, setting up a final leg shoot-out for the remaining podium places. Once again, the two German drivers battled, with James Hart also keeping them honest throughout. Martin took the win, thus securing the runner up spot, with Max finishing third overall. The victory clearly meant a lot to Jimmy – asking for a few minutes to gather his thoughts before being able to verbalise his emotion. 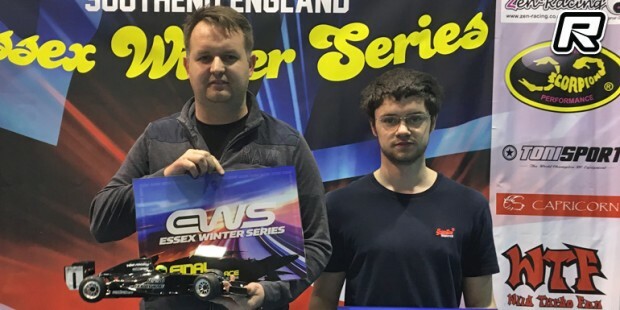 He highlighted that he had set himself a goal of winning the “Essex Treble” – victory at the Essex Summer Series event last August, the overall Essex Winter Series title, and the ICC win. With the first two accomplished before Christmas, the Xray driver said this final piece of the jigsaw “means pretty much the same as a DHI or Vegas win”, noting that the increasing number of foreign visitors at the event this year has marked it as a “premier race [he] is proud to have the winners trophy from”. The Formula class was also decided in just two legs, with Irish driver Keith Dempsey taking the overall victory, in front of Martin Hofer and Andrew Walters. 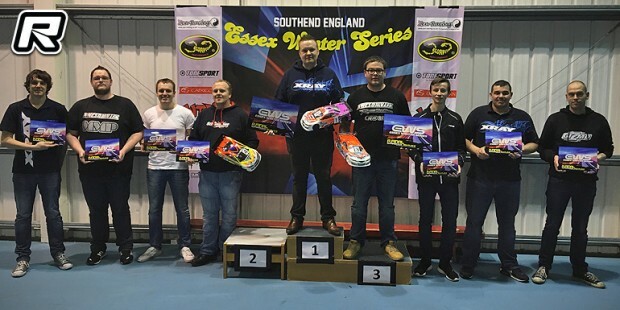 Thanks to Oli Meggitt for the report.